As he campaigned for president, Donald Trump spoke about American companies that were planning on closing their U.S. based facilities and moving to Mexico. Air-conditioning manufacturer Carrier Corp. was one of the companies Trump called out by name. With its intended relocation 1,400 jobs at its Indianapolis-based manufacturing facility would have been lost. Think of that as 1,400 families wondering how they would keep a roof over their heads and food on the table. With his Jan. 20, 2017 inauguration still weeks away, president-elect Donald Trump has already secured an early victory as he and Vice President-elect Mike Pence directly intervened calling Gregory Hayes the CEO of United Technologies Corporation, Carrier’s parent company, persuading the manufacturer to remain in Indiana. Under terms of the agreement, Carrier will receive tax incentives from the state economic development corporation to keep the jobs in the state. Watch this video to see why Donald Trump’s election was not a shock to those who pay attention to what’s actually going on in this country. When a company official told longtime employees, “I want to be clear. This is strictly a business decision,” it moved lifelong Democrats to vote for the man who promised to keep American jobs in America. Carrier workers in Indiana are paid approximately $20 an hour as compared to Mexican workers who would have earned $3. During the announcement, the company rep repeatedly told the disgusted employees to quiet down. United Technologies Corporation (UTX) took a nosedive on the heels of its announced move to Mexico and is still trying to rebound. Other companies Trump mentioned during the campaign that were poised to head south are Ford Motor Co. and Nabisco, maker of all-America cookie favorite Oreo. During a speech in Charlotte, N.C., Obama’s VP Joe Biden angrily declares that the middle class has been “buried” during the past four years. The gaffe-prone Biden is indeed incompetent and ham-handed, but at least he correctly assessed the effect of the past four years under his boss, Barack Obama. The newspaper is at it again. How the leftists at the Periódico de la República de Arizona (Arizona Republic) love to demean Republicans! The more conservative their views, the more they can expect to feel the pain of a thousand cuts. The most recent object of derision is state Rep. David Stevens. Here in the “Political Insider,” Mary Jo Pitzl did her best to make the Sierra Vista Republican (Dist.25) sound like an escaped inmate from the State Hospital’s mental facility. His “blunder?” According to Pitzl, Rep. Stevens became a “one world conspiracy theorist” when he dared mention the Amero. It’s the “stuff of urban legends,” she mocked in the column. Ditto CANAMEX, the strategic mega Super Corridor intended to link the United States, Canada and Mexico as part of a plan to create a North American Union along the model of the European Union. It’s been in the works for years and explains the accompanying “comprehensive immigration reform” scheme to allow the vast majority of illegal aliens now in the U.S. to remain under a “guest worker” or “pathway to citizenship” provision. The underlying agenda is a creation of a NAFTA on steroids environment in which workers, trade and capital will be allowed to flow unimpeded within the trilateral North American community consisting of the United States, Canada and Mexico. Presently, the United States has 84% of the series of highways completed, Mexico is 86% compliant. The Canadian portion was completed in 2007. Rail lines, pipelines and fiber optic telecommunications infrastructure are also part of the plan. That was enough to thrust Pitzl into hyperbole overdrive, dredging up her “one world conspiracy theorist” and “stuff of urban legends” rhetoric. But on October 11, 2007, Seeing Red AZ wrote that Mexico’s former President Vicente Fox, verified the very same monetary scheme in an interview on CNN’s Larry King Live. Our post at the time was titled Mexico’s former President confirms plans for regional currency. Click on the link and read it. Unfortunately, the accompanying video is no longer active due to copyright issues, but the word-for-word text of the exchange remains for you to see. Homeland InSecurity Chieftain Janet Napolitano has authorized the denial of U.S. entry to Canadians with non-violent mental health histories who desire to travel south of the border for business or family trips. It turns out that personal information entered into the Canadian police database is accessible by American authorities. As an example, a 65-year old Toronto resident who attempted suicide several years ago was stopped at customs after showing her passport and taken to a secondary screening. There, a Customs and Border Protection officer informed her that he had information that police had come to her home in 2006. In 2009, Napolitano inflamed American citizens with the release of a Department of Homeland Security report titled “Rightwing Extremism: Current Economic and Political Climate Fueling Resurgence in Radicalization and Recruitment,” in which she warned of the possibility of violence by unnamed “right-wing extremists” concerned about “illegal immigration, increasing federal power, restrictions on firearms, abortion and the loss of U.S. sovereignty” — singling out returning war veterans as particular threats. Seeing Red AZ previously covered her irresponsible — some might say “lunatic” report. Her not-quite-an-apology, nearly two weeks later, (“To the extent veterans read it as an accusation … an apology is owed.”) was greeted by the liberal taxpayer-subsidized National Public Radio (NPR) questioning whether an apology was even necessary. The fact that she was born in New York City is obviously a bonus for Napolitano. If she was a Canadian citizen, using her own restrictions, Janet Napolitano might well be precluded entry into the USA. Death rides: These buses continued to operate because…? The company that owns a “tour” bus that rolled over on Interstate 10, killing six people, has a history of safety violations, no federal record of insurance and could not legally carry passengers in Arizona, according to a report in the daily. Transportation-safety records and federal regulators confirm the only two buses owned by Tierra Santa Inc. of Van Nuys, Calif., were not licensed to carry passengers across state lines, although they continued to transport people from Mexico across the Southwest to California. They were stopped and cited three times last year by state and federal transportation inspectors in Arizona, New Mexico and Texas. And these passengers were just “touring” vacationers? Federal regulators were unable to say why the buses were allowed to continue operating. A Rasmussen Reports national poll conducted last August found that just 19% of Americans say the U.S. Congress should let commercial vehicles from Mexico cross the border and carry their loads on American highways. Sixty-six percent (66%) of U.S. adults oppose lifting the congressional ban on Mexican trucks operating in the United States. After holding firm against the tide, Great Britain is now considering implementing the Euro. And Denmark, another European Union nation which has steadfastly refused to accept the EU currency is now planning another referendum on the issue. The Danish voted against joining the union in 2000. Breitbart has the article here. 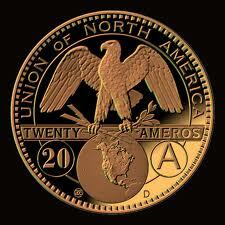 In October 2007, Seeing Red AZ posted this “Larry King Live” interview of former Mexican President Vicente Fox, confirming plans for implementation of the Amero, a form of currency similar to the Euro, designed for use by the United States, Canada and Mexico. We urge you to watch the brief but informative video at the conclusion of that post. Addressing a crowd of 2,000 attending the La Raza (“The Race”) convention in San Diego, John McCain did what he does best before Hispanic groups: groveled. It does him little good, since the Latino vote is mostly with Obama, leaving a mere 27 percent of their likely voter scraps for McCain. During a time of war, with soaring gas and food prices and multitudes losing their homes to foreclosure, it seems there could be higher priorities for a presidential candidate. Remember the amnesty scheme by the same name that fell to defeat after American citizens unleashed their fury as never before? McCain intends to resurrect it. His new message is, “We will secure the border first.” First before what, Senator? McCain has often addressed Hispanic immigration advocacy groups, including the League of United Latin American Citizens and the National Association of Latino Elected and Appointed Officials, using more implied language rather than the candid vow to advance McCain-Kennedy he gave to La Raza. He made a point of thanking La Raza’s former CEO Raul Yzaguirre, Hillary Clinton’s lead immigration adviser, for “the privilege of over twenty years of friendship and counsel he has so generously given me.” Add to the mix McCain’s own Hispanic Outreach director, Juan Hernandez who says we are not countries, merely regions, and you see where we are headed. Responding to those who chided him for inaction regarding desert deaths of illegals entering the U.S. McCain decried the deaths as a “failure of the federal government to exercise its responsibilities.” The obvious answer would have been: To ensure their safety, Mexican citizens should stay home. Meanwhile in an unprecedented drop to single digits, just 9% of voters gave the Democrat-controlled Congress good or excellent rating. This dismal ranking is a first in tracking history. Yet McCain is keen to remind us of his cross-over alliances. Conservative Republicans would prefer he remember us. You are currently browsing the archives for the North American Union category.